Let’s get two things out of the way first. First, this book has a ridiculously beautiful, vibrant cover with such amazing colors and title typography, and I’m not at all ashamed to admit that it was what got me to check out this novel in the first place. Second, after reading this, I really, really want to go to New Orleans and have a beignet more than I ever have before. There’s magic to a story that really transports the reader, and Even if the Sky Falls is one such tale. The novel is about Julia, a teen girl running away from something in her past. She is in New Orleans with her church group to help build houses in a Habitat for Humanity type deal, but in a split second, Julia changes the course of her trip and escapes into the festivities of Midsummer Mardi Gras. She meets Miles, and together, they lose themselves in the festival, the food and the fun of New Orleans. That is, until a hurricane sweeps through the city and unleashes a wave of chaos that results in unexpected tragedies. If you’re thinking that this book sounds an awful lot like a movie, you’re not alone. It actually has all the elements for a visually stunning film, from a colorful setting to action-packed sequences to memorable personalities. And it reads like a film, at least to me, as I could easily imagine everything translated on screen. This isn’t something I’d consider a fault, and I’m actually rather inclined to say it is a point in the book’s favor. Very few books can manage to get me “seeing” everything play out in my mind as if on a screen, and this happens to be one of them. But really, I feel like Garcia’s biggest accomplishment with this story is how she transports the reader to New Orleans. She uses just the right amount of description to show off the different locations Julia visits, which is already pretty brilliant in and of itself. But then she takes it one step further by layering emotions over each spot, which invites the reader to feel things and form a more intimate connection with the setting. I felt like I really knew these spots – the streets, the balcony, the pier, the hotel, the pool – and it made me want to see New Orleans for myself more than ever. It must be said, however, that Garcia’s portrayal of Julia was also well done. She’s just a girl longing to be someone else for a change, simply to escape the past that haunts her thoughts. Who of us hasn’t felt similarly at one point or another? Julia’s desire for freedom, to have some semblance of control over her life and to try to push away all her unresolved feelings – these are all things anyone could find relatable. While I didn’t necessarily always agree with her choices (which I’m sure comes with age and experience), I understood where she was coming from for the most part. She acts on emotion, she makes mistakes, she learns from her experiences, she grows… and I honestly couldn’t ask more of a character. 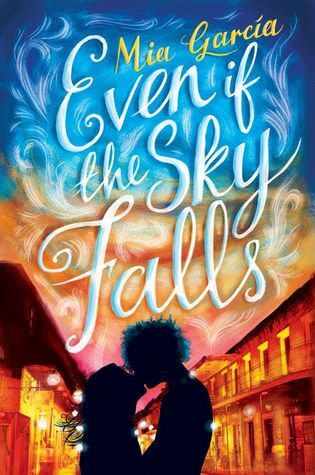 The magical combination of New Orleans, a strongly voiced main character, charming secondary characters and a fast-paced story really made Even If the Sky Falls a good read. I found it utterly compelling, and couldn’t set it down once I’d started it – which is always a good sign, in my opinion. I’d highly recommend giving this novel a shot, as the story in its pages certainly does its gorgeous cover justice. What costume would you wear for Midsummer Mardi Gras? I was extremely close to going with one of my typical picks (a butterfly or a fairy), but then I realized that this would be the perfect opportunity to step out of my comfort zone a little. I've always been fascinated by peacocks, and so I would dress up in a glittering peacock costume, vivid tail and all. It's basically the best excuse to wear something covered in glitter and sequins, and in complementary shades of blue, green, purple and gold. Julie is desperate for a change. So she heads to New Orleans with her youth group to rebuild houses and pretend her life isn’t a total mess. But between her super-clingy team leader and her way-too-chipper companions, Julie feels more trapped than ever. In a moment of daring, she ditches her work clothes for DIY fairy wings and heads straight into the heart of Mid-Summer Mardi Gras, where she locks eyes with Miles, an utterly irresistible guy with a complicated story of his own. And for once, Julie isn’t looking back. She jumps at the chance to see the real New Orleans, and in one surreal night, they dance under the stars, share their most shameful secrets, and fall in love. But their adventure takes an unexpected turn when an oncoming hurricane changes course. As the storm gains power and Julie is pulled back into chaos she finds pretending everything is fine is no longer an option.